Is Taliban Serious About Talks? Plans to establish a Taliban political liaison office in Qatar suggest peace talks may finally make progress. But are the Taliban really ready to stop fighting? After years of stagnation and secrecy, the peace talks to end the Afghanistan war are finally making progress. Last week, an Afghan Taliban spokesman said that his group had agreed in principle to establish a political liaison office in Qatar for the purpose of seeking a negotiated settlement to the conflict. The Obama administration and, less enthusiastically, Afghan President Hamid Karzai have welcomed the development as evidence that the Afghan peace process is finally making progress. U.S. and German officials have been holding clandestine discussions with Taliban representatives for about a year. They’ve been engaged in “talks about talks” – discussing what steps to take to launch formal peace negotiations, what items should be discussed, and what the framework of a possible settlement might look like. Establishing such an office is an essential prerequisite for launching formal peace negotiations. The Taliban’s interlocutors must know they are talking to authorized representatives of the movement rather than false emissaries who, in the past, have swindled money from the United States and last year assassinated former Afghan President Burhanuddin Rabbani, head of the Afghan Peace Council. But creating such an office is only the first step of many that will be needed for a viable and durable Afghan peace settlement. And, despite recent positive developments, the odds are still against one. Karzai’s foreign backers have overcome their initial doubts and become enthusiastic backers of any peace settlement. Despite the surge in troops and other resources entering Afghanistan, NATO forces and their Afghan allies acknowledge that they couldn’t plausibly hope to kill or capture all the Taliban insurgents. More practically, their wary publics are demanding an end to the Afghan mission, so most NATO governments have announced they will withdraw all forces by 2014. Foreign governments are already reducing their troop deployments and foreign aid contributions to Afghanistan. The renewed peace process will have to overcome past problems that have blocked any settlement. 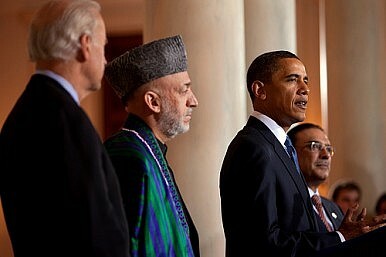 For several years now, Karzai has offered to negotiate with “moderate” Taliban leaders, renegade warlords, and other groups and commanders fighting his government, providing they agreed to end their insurgency and accept the legitimacy of his government and the basic tenets of the Afghan constitution adopted following the Taliban’s defeat in late 2001. The Afghan government has also offered various forms of amnesty and other inducements to guerrilla fighters who pledge to cease fighting. Until now, the Taliban leadership has publicly rejected Karzai’s reconciliation overtures and denounced the reintegration process. Taliban leaders had demanded that all NATO troops leave Afghanistan as a prerequisite for starting the negotiations. In addition, many former fighters who participated in earlier reintegrated schemes subsequently took up arms again because they didn’t receive adequate financial assistance, employment retraining, or protection. In terms of the procedures, any Taliban negotiators will need guarantees for their safety, while the Afghan government and its foreign partners will need to ensure that the Taliban actually engages in meaningful talks rather than tries to use the office for purposes of propagating its views and recruiting more members. Their merely recognizing the office incurs the risk of elevating the movement’s legitimacy.